Did you pick your name for Prince Goro? As a viking, I shall bought a print and just did it. It looks like a painting! How did you accomplish that? I enjoy the texture look in the clouds. The concept is great, very creative. Digital work is great. Time to go on a raiding party. I can almost hear the thunder of the engines mixing with the war drums and battle chants of the raiders. Very cool concept and I like the style you decided to go with. Great art! I have a question though. If you want to study this kind of art at university, what would the program be called? Digital art??? Thinking about applying for several art schools in london but not sure of the program yet. Hmmm not sure. Probably illustration major? I went to school for 3D character animation. I didn't go to school for art. Ok, I've been thinking about applying for digital art at goldsmiths since there a bit more wide. Been looking at some game design courses but afraid to end up freelancing since it's directed for drawing and animating. I want a combination of doing these digital drawings with programming, visual effects and those kind of stuff. Got any course suggestions I should look for? I really like this take on both steampunk and vikings! Awesome! I'm sorry, are you ever NOT awesome? whoa...now that is some modern whoopass! Watch out for dragons up there! Love the lighting and the idea! nicely done it reminds me at AirBuccaneers "game"
Thank you for the enormously fun visual! Your rough brush work makes it all the better for me, since a sharp image would stress the aspect of technological modernity over the sense of this being someone's record of a saga! This is 100 per cent awesome and people who complain about horns or sails should take their sperg elsewhere. It is not awesome because it is plausible; it is awesome because it is awesome. A oneness of awesome, if you will. 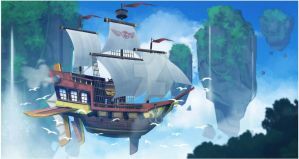 Nice concept, but guess they'll need to lower the sail while propelled by the engines otherwise the sails would act like a parachute breaking the ship. On a still day, yes, which would be an understandable assumption. Actually, wind velocity is relative to the aircraft, so they might well be travelling with a brisk tail wind that slightly exceeds their speed. You've surely experienced this while bicycling. Next time, pretend you're a Sky Viking! Indeed you are correct. But to play devils advocate, if the requirement to avoid air resistance while travelling with the sail up is to match direction and velocity with the wind I would still like to venture that the sail constitutes more of a hindrance than an aid. And here we come to the issue of allowance in suspension of disbelief, our tendency to draw the line of acceptable "unrealism" according to personal comfort and conviction. For example, I quite enjoy musical motion pictures whereas some of my own kin cannot abide the cast breaking into song and dance. I understand that such phenomena are uncommon in our public, and likely private life, but such is true of a battery of tools in even "realistic" documentaries. Might I further point out that flashmobs have begun to bleed that particular "unreality" into our own world? Thus, DeviObserver's evaluations are intended to fit within the context of the artwork as expression, since the artwork itself -- paint, pixels, and all -- is but a phantasm. It is within that framework that the sails can be declared an acceptable conceit not only on the part of the artist, but likely on the part of those Sky Vikings themselves! Speaking of navies, just look up the latest USN "destroyer", the Zumwalt class, to witness shipbuilding stripped of century-old conceits. It would appear that nearly every line of the storied vessels of yore has been declared more of a hindrance than an aid! P.S. I was delighted with your Sky Viking postscript rejoinder! I totally agree with you, there is room for suspension of disbelief within art. But we need to establish a baseline for the discussion. If you in your first reply use physics to dispute my claim, Then we have established that those are the rules we play by. Switching to a philosophical standpoint later on is like an apples and oranges argument. About making friends online, It's easier to walk away from an argument with someone you never met. Since all you have to do is stop posting. IRL friends will be around the next day and will therefore be more willing to reach a mutually acceptable conclusion to any discussion. 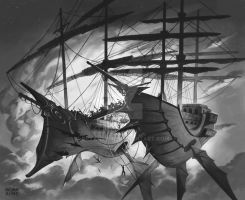 if I interpret the treasure planet correctly the ship in that one mostly sail through space with some kind of atmosphere bubble around the ship. which would suggest that they wont encounter any air pressure while sailing through the vacuum.